To send a text message, open the Messages app on your Samsung Galaxy Note 3. If the app opens to a specific conversation, press the Back button to return to the main Messages screen. 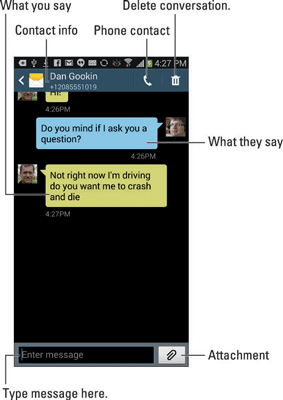 The main screen lists all your text message conversations; touch a conversation to peruse any earlier dialogues. Text messages are sent primarily to other cell phones. As long as you have a mobile number to send to, or a contact with a mobile phone, you can fire away the text message. Sending a new message works differently, depending on whether you want to continue a conversation or start up a new conversation. To continue a conversation, choose that contact or phone number from the Messages app main screen. Type a new missive in the Enter Message text box. Touch the Send icon to whisk off the message. Then wait on tenterhooks until the other party replies. Touch the New Message icon on the Messages app main screen. The New Message icon is shown in the margin. Type the phone number or a contact’s name into the Enter Recipient text box. As you type the number, any matching contacts appear in a list; choose a contact to save yourself some typing time. If you’re composing a gang text, type additional numbers or contact names. Normally, you text only one person at a time. When you specify multiple contacts, you create a gang text. Type the message in the Enter Message field. Touch the field to select it. The onscreen keyboard appears. Type your message, but be brief: A text message has a 160-character limit. You can check the character count indicator on the screen to see whether you’re nearing the limit. The message is sent instantly. That speed is no guarantee that the other party replies instantly, if at all. Even the quickest reply I’ve seen takes several seconds to appear. Repeat Steps 4 through 6 as needed — or eternally, whichever comes first. There’s no need to continually look at your phone while waiting for a text message. Whenever your contact chooses to reply, you see the message recorded as part of an ongoing conversation. You can also send a text message from the Contacts app: Display information about a contact and touch the Text Messaging icon next to the contact’s phone number. After you touch that icon, the Messages app starts and you can compose the message. Quickly compose a text message to a contact by swiping that person’s entry to the left in the Contacts app. If you’ve sent the message to a phone number instead of to a contact, consider adding that number to the phone’s address book. One way to do that is to long-press the number and choose the command to create a new contact. You can send text messages only to cell phones. Aunt Jane cannot receive text messages on her landline that she’s had since the 1960s. A tenterhook is a type of hook used to stretch woolen fabric for drying purposes. The phrase on tenterhooks refers to the fabric’s tension and is a metaphor for anxiety or suspense. Do not text and drive. Do not text and drive. Do not text and drive.